Edward Albee’s Seascape—playing through February 17 at The Geary—is a story of transition. Nancy and Charlie have recently retired. Energized by the possibility of change, Nancy wants to explore the world, but her husband Charlie is reluctant. As a character, Charlie is fearful of the unfamiliar. The same is not true of the actor playing Charlie. If you’ve seen a show at A.C.T. in the last 20 years, it’s likely you’ve caught actor James Carpenter. In addition to 12 years as Scrooge in A Christmas Carol, Carpenter has performed in A.C.T.’s Heisenberg (2018), Rock ’n’ Roll (2008), ’Tis Pity She’s a Whore (2008), Cat on a Hot Tin Roof (2005), A Doll’s House (2004), and Glengarry Glen Ross (2001). Now, he’s back as Charlie in Seascape. This familiar face is excited to be collaborating with the newest face of A.C.T. Artistic Director Pam MacKinnon is making her A.C.T. directorial debut with Seascape, exploring this story of transition as she transitions into her new leadership role. We recently sat down with Carpenter to get a glimpse into MacKinnon’s rehearsal room and hear his take on where A.C.T. is headed. Actors Ellen McLaughlin, Sarah Nina Hayon, James Carpenter, and Seann Gallagher in the Seascape rehearsal room. Photo by Beryl Baker. She is incredibly collaborative. 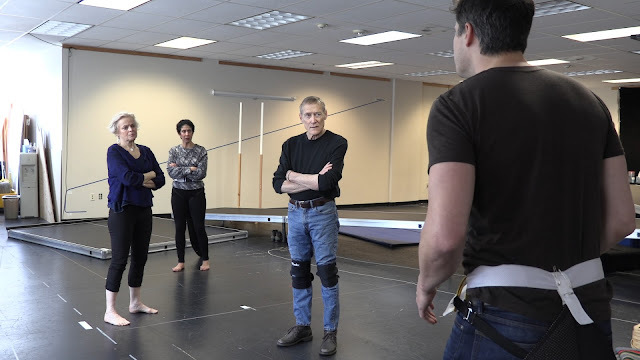 Our rehearsals engendered many conversations as to what was going on under Albee’s brilliant dialogue. What’s driving the words they speak so easily? We had to figure out who Charlie and Nancy are and what the course of their forty-some years of marriage had been like. We had to create backstory, which is not stated directly. But clues as to their lives are strewn liberally through the script, and we’ve teased them out to form a past. We wound up constructing loose histories of their years together and where they now find themselves: in the twilight of their years, children gone to lives of their own, both fully retired—an end and a beginning at the same time. Pam never interfered in these constructed histories, and she was very hands off throughout the rehearsal process, letting me stumble around, allowing me to realize by myself that a choice I’d made was perhaps not an ideal one and to search for something better. She was always there, listening and watching. She did not so much tell us what to do but rather let us find our own way, trusting that the cast she’d selected was up to the job. We refined and defined moments, glued them together, ran them in rehearsal to see how they worked, and then refined them some more. Through it all, Pam guided and led very openly, very generously guided and encouraged—an actor’s director, truly. All of the laughter, the discoveries—keeping a straight face is tough in this one! Getting reacquainted with Ellen McLaughlin [who plays Nancy]—watching her fine, specific work. Sharing the stage with the wonderful Seann Gallagher [who plays Leslie] again, and getting to know, work with, and admire the work of Sarah Nina Hayon [who plays Sarah]. Where do you see A.C.T. heading under Pam’s leadership? I can’t really presume to guess where Pam will steer the organization, but I feel with all my heart that A.C.T. will find a new direction and one that will prove fruitful, productive, challenging, and exciting for artists and audiences to come. I have huge hopes. Come see the fruits of their collaboration, and join us for this comedy about love, laughter, and talking lizards. Get your Seascape tickets today—the show must close February 17! Nancy and Charlie (played by Ellen McLaughlin and James Carpenter) are greeted by a human-sized lizard (Seann Gallagher). Photo by Kevin Berne.